This book will aim to provide relevant theoretical frameworks and the latest empirical research findings in the area of informatics, business communication and management. The general mission of this book is as follows: Assuming that business organizations as well as individuals are entirely linked together in internet, a new approach to business communication and management must be developed that cover the estimation of synergy effects, the compatibility and interoperability problems, data analytics development, business and social value creation, and the information overload reduction and information protection. This book aspires to shed light on the phenomenon of university learning from different perspectives, thus linking several matters that we tend to think as of belonging to different disciplines though there is a unifying element in all of them. 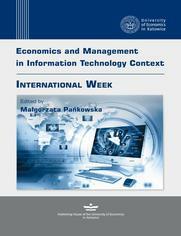 The target audience of this book will be composed of professionals and researchers working in the field of informatics, business communication and management in various disciplines, e.g., library, information and communication sciences, administrative sciences and management, social science and marketing, logistics, education, computer science, and information technology.